Well, I always like reviewing 1More products, and I got to review 1More. Okay, that is not a good way to start this, and I’m too lazy to review my previous articles to see if I told that bad joke before. I’ll restart this review of the 1More Spearhead VR and say that it received a CES 2018 Innovation Award. This was where I first had a chance to try out the 1More Spearhead VR Gaming Headset. I am assuming that it has the VR suffix because it has made for a “3-dimensional gaming and entertainment experience” with its 7.1 Channel Surround Sound. I will tell you that this has a bass to melt your face, and I don’t know if I ever made that comment on any pair of headphones before. I believe that the deep sound is because of a 50mm Maglev Graphene Driver, but what is really surprising is how light they feel on the head. This lightweight construction also has some ENC Dual Microphone technology, and it is quite something because the mic can filter out the background noise. 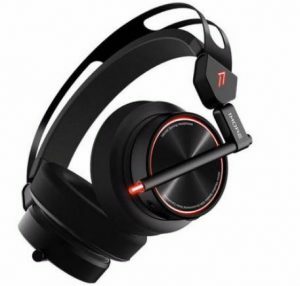 Oh, and you can see the lightsaber-like light on it, which is fully customizable with millions of color options for syncing with your game, because yeah, these are some great gaming headphones, yo. Seriously, these are some great gaming headphones, and they have some superb on the ear controls. I should say that you can connect via USB and 3.5 mm Audio cable. So, I would recommend the Spearhead VR if you are into some serious gaming. You can pick it up on the 1More site for $149.99.